Transferred from the Rotunda Museum of Artillery, Woolwich, 1927. From Rhodes, acquired by Sir J. Lefroy 1867. 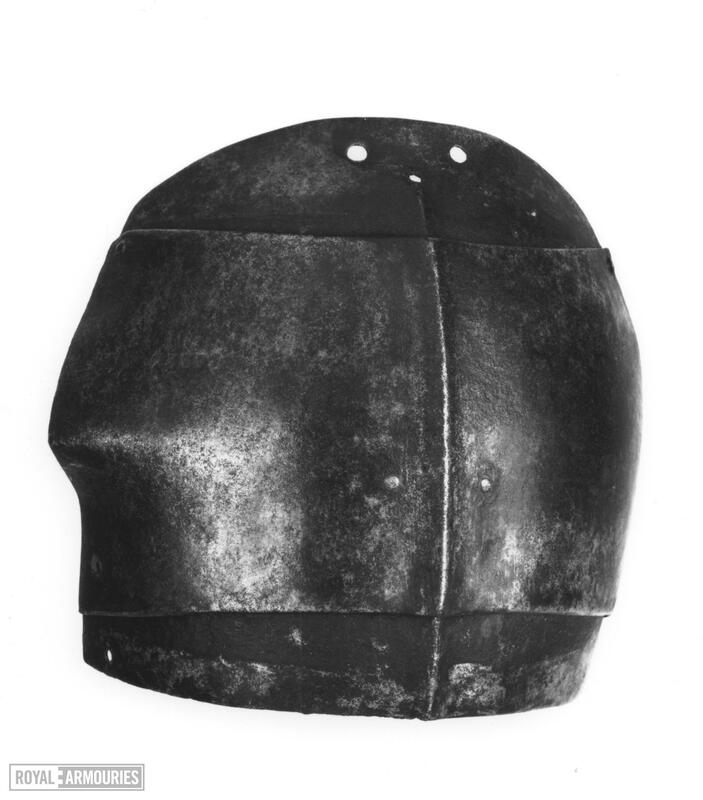 The defence is made of four lames, with a large, rounded main plate with pronounced medial ridge which continues onto the lames above and below. The front edge has a triangular flange, and the plate deepens at the rear where it has been trimmed. At the centre is a group of three rivet holes, with original flush rivets in the lower two, for an internal leather. Above and below, the main lame overlaps a narrow lame of even depth. The lower of these is articulated by sliding rivets in pointed lobed terminals at either side, and has a pair of flush rivets at the centre of its upper edge for the leather. At its lower edge are three rivet holes for articulation to the missing lames below, and near its outer edges two rivet holes of indeterminate function. The lames above the main plate overlap upwards, and are articulated by rivets at either side. The upper lame has two central holes without eyelets for arming points, at its upper edge. Between these is the rivet hole for the internal leather. The upper edge has an inward turn. The main lame is fitted with a fragmentary gardbrace of unusual form, of roughly elliptical shape. 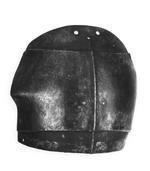 This has a notch at the centre of its front edge, and has a transverse pair of rivet holes at the same level. The rear edge is outwardly curved, and probably indicates the original line of the rear edge of the main plate. The rivet by which the gardbrace fragment is attached has a flat internal head stamped with a rosette. Stamped on the gardbrace is the Rotunda number MA 2320. The lames above and below the main plate are marked with a single V-shaped nicks inthe edges, to the rear of the centre. Official Catalogue of the Museum of Artillery in the Rotunda, Woolwich, London, 1889: 150, no. 16.268.